The male and female doctors developed a list of proposals for the improvement of quality in gastrointestinal endoscopy. These proposals were topic of a discussion with the Minister of Helath, two consultants and the Foundation Wienbeck. Two doctors shall be invited to Germany for three month each to complement their endoscopy training. Endoscopes and endoscopy accesoires are still urgently needed. The endocopy workshop could meanwhile move from a provisional to a well suited room. 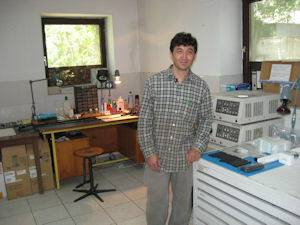 Since the setup of the workshop, endoscopes from Kabul and other cities are frequently brought in for repair. 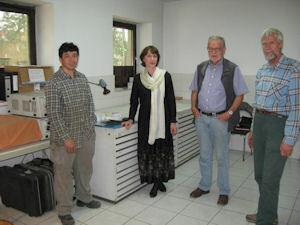 Mrs Wienbeck and Prof. Gugler brought additional equipment and spare parts from Germany. In the workshop on the premises of the German Medical Service: On the right: Georg Westermayer, who made the setup of the workshop at the GMS possible. Rajab Ali Ahmady next to his desk.